Our product range includes a wide range of indian sarees, designer sarees, wedding designer saree, fancy party wear saree, bandhani saree and georgette saree. 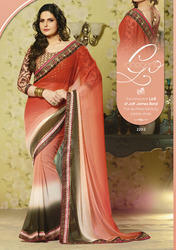 We are offering Designer Sarees to our valuable customers while keeping in mind their demand. We offer product to meet the satisfaction of customers by our best product. Turn every head your way as you stroll across in an outfit from the new Indian cross collection.Celebrate Wedding Designer Saree your classy side with this perfect concoction of chick style. As shown, an Un-stitched Raw Silk Blouse is available in Red color. Do Note: Slight variation in actual color vs. image is possible. 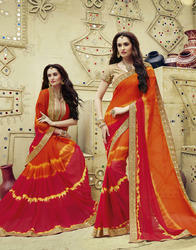 We are offering Fancy Party Wear Saree to our valuable customers while keeping in mind their demand. We offer product to meet the satisfaction of customers by our best product. Description: This Exclusive Cream With Purple and Beige Color which give gorgeous look ,this designer saree embroidery work on in floral pattern.Saree is especially ready for any ceremony. This color is one of the strongest fashion statement Elegant Designer Saree of the season and bold designs give fashion a more ethereal and exotic effort. As shown, an Un-stitched Raw Silk Blouse is available in Beige color. Do Note: Slight variation in actual color vs. image is possible. Turn every head your way as you stroll across in an outfit from the new Partywear Saree with Border Indian cross collection.Celebrate your classy side with this perfect cocoction of chick style.As shown, an Un-stitched Raw Silk Blouse is available in Orange color. Do Note: Slight variation in actual color vs. image is possible. Women have a great passion to wearing voguish and Georgette Sarees . And saree is one of them which become the favorite of every women.Women can wear it in parties,festivals, and wedding ceremonies Here we are going to presenting you some sophisticated saree.These entire saree made with fancy work like embroidery. You can see that all these saree is very fascinating and it is made according to women choice. And these red and multicolor saree is especially ready for any ceremony.Women will surely like these awe inspiring saree. 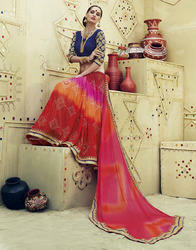 In our extensive product range, we are highly engaged to provide a quality approved range of Traditional Designer Saree. The offered designer saree is designed using best in class fabrics by our experienced workforce in observance with ongoing fashion trends. 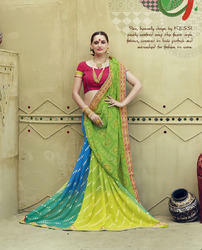 We offer this designer saree in diverse colors, and patterns as per the choice of customers. Our valuable clients can easily purchase the designer saree from us in a confine time at affordable rates. Description: This Exclusive Cream With Pink and Blue Color which give gorgeous look ,this designer saree embroidery work on in floral pattern.Saree is especially ready for any ceremony. Description: This Exclusive Cream With Pink Pallu And Black Color which give gorgeous look ,this designer saree embroidery work on in floral pattern.Saree is especially ready for any ceremony. Description: This Exclusive Cream With Red and White Color which give gorgeous look ,this designer saree embroidery work on in floral pattern.Saree is especially ready for any ceremony. To net propelling demands and needs of our valued patrons, we are providing a stunning collection of Bandhej Designer Saree. Our offered collections of these sarees are knitted using best quality fabric and ultra-modern machines by our highly skilled designers at well-equipped production unit. Our offered sarees are widely demanded by the clients for their quality and cost effectiveness. 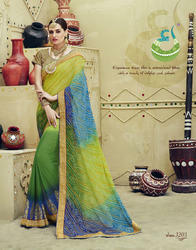 Apart from this, the offered sarees can be availed in a variety of designs and colors to cater their specific needs. We brings you an exclusive fresh look with the designs of collections. Because Stylish Partywear Saree fashion welcomes the change of season by turning the page on the past and introducing a host and fabulous trends.As shown, an Un-stitched Raw Silk Blouse is available in Red and Pink color. Do Note: Slight variation in actual color vs. image is possible. We are an affluent organization, offering a superior quality array of Wedding Saree. Our skilled designers design this saree in compliance with the latest market trends using quality proven fabric along with progressive technology. Our offered saree is ideal for every fashion loving women and they can wear it on any occasion. Clients can avail this array from us in various alluring designs and colors as per their requirements at market leading prices.